At this waterside location, railings used to obstruct the view to the water. Now the guests enjoy the far reaching views across the marina and have a “Clear View” of the water craft coming and going. The new glass railings were installed to give the customer a floor to ceiling view of the marina outside. Another instance where glass opens the current space to take in the outside. Making what was once perceived as a closed in room is now a room which never ends. Link here to review more about glass railing projects by LBG. 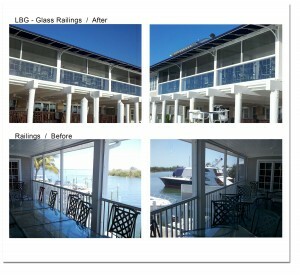 Contact LBG today to see how you can expand your current patio or deck with glass features. Sign up for LBG e-newsletter.